Hello! Its been so long since my last post! Life had been busy but great with my little one 🙂 She’s one year old now and just full of cuteness! I will spare you from listing down all the stuff she can do now because it is a pretty long list! We had been doing bathroom remodel for the past month (with contractors) and I havent really made anything presentable, except for a machine knit sweater which I am not 100% crazy about. But! I had knitted this hat for a friend’s baby shower last year. The baby’s dad is really into Star Wars so I thought I’d knit a nice warm hat for him. Well, the baby was born and amazingly it seems to fit him now that the temperature finally dropped! Isnt he such an adorable little Jedi? p.s. 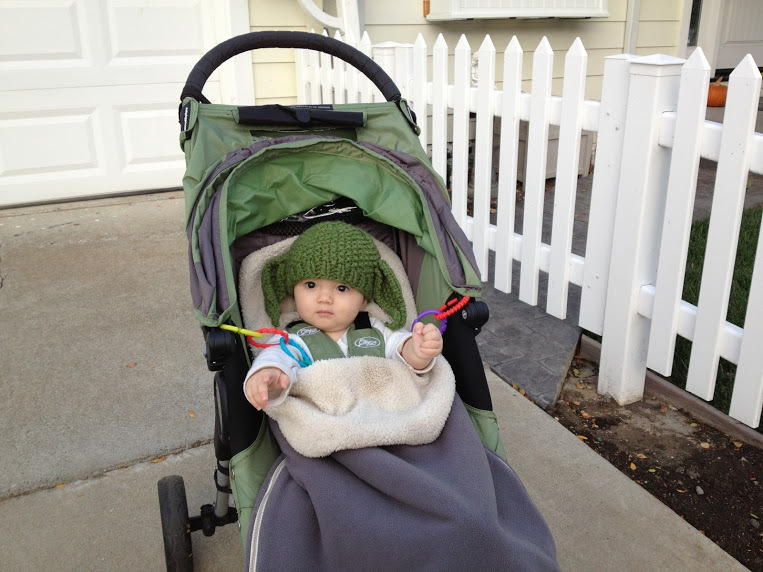 I didnt really use a pattern – just seed stitch for the hat part, and then picked up a few rows and knitted the ears! This entry was posted on Friday, November 9th, 2012 at 11:55 pm	and posted in finished pieces, knitting. You can follow any responses to this entry through the RSS 2.0 feed. Just found your blog! I’m petite, too. I sew but don’t knit and that this was just the greatest hat. Looking forward to following.